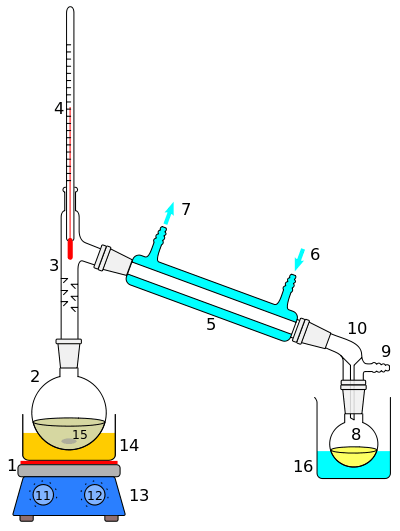 An alembic (Arabic الأنبيق (al-anbīḳ) from Greek ἄμβιξ (ambix), "cup, beaker") is an alchemical still consisting of two vessels connected by a tube, used for distilling chemicals. 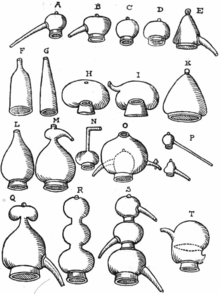 The complete distilling apparatus consists of three parts: the "cucurbit" (Arabic ḳarʿa, Greek βίκος), the still pot containing the liquid to be distilled, which is heated by a flame; the "head" or "cap" (Arabic anbiḳ, Greek ἄμβιξ) which fits over the mouth of the cucurbit to receive the vapors, with an attached downward-sloping "tube" (Greek σωλήν), leading to the "receiver" (Arabic ḳābila, Greek ἄγγος or φιάλη) container. Retorts have the "cap" and the "cucurbit" made into one. 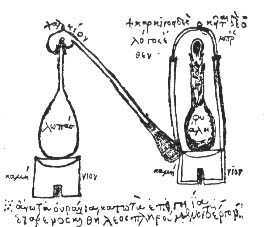 The anbik is also called the raʾs (head) of the cucurbit. 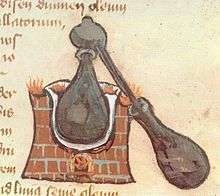 The liquid in the cucurbit is heated or boiled; the vapour rises into the anbik, where it cools by contact with the walls and condenses, running down the spout into the receiver. 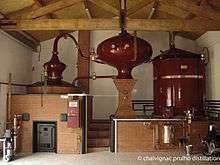 A modern descendant of the alembic is the pot still, used to produce distilled beverages.